New vs Used: The RV Buying Dilemma. Should you purchase a used travel trailer or a new one? How can you get the best deal on used class b motor homes? You have made the decision to purchase an RV. You have done your homework, know all the features you want, the size, maybe even the model. 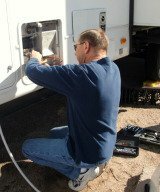 Now, for the big question, do you purchase new, or do you go with a used RV? This dilemma is played out over and over every day. Inevitably, folks will settle on making that purchase (a pretty major purchase to most people) and then begin to mull over the great new versus used debate. So, which is better in the new vs used challenge? Of course, the better choice when considering a new RV or a used RV is making the choice that is right for you. 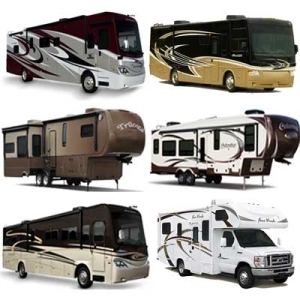 An RV is a very personal item and you have to consider the benefits that each choice as well as the drawbacks. Take the time to shop around, compare prices and features and go into the purchase with your eyes wide open. In other words, don't "settle" for something that you don't really want just because the price is good. Exercise patience, wait and eventually you will find what you want. Take your time when deciding on a new versus used RV. How will you use your RV? Do you know exactly what features you want in your RV? How many people will use your RV? Would you consider purchasing a used RV? Of course, the primary benefit of purchasing used travel trailers or a used motorhome is that you won't pay as much as you would if you bought a new RV. If budget is a concern, then a pre-owned RV is a good way to go. You won't pay as much up front for a used RV and you would a new RV, but an added benefit is that if you decide that it isn't exactly what you wanted, you aren't out as much money as you would be had you purchased your RV new. While there is somewhat of a stigma attached to purchasing a used vehicle, if you shop wisely and remain patient, you aren't likely to get stuck with someone else's "lemon". See, an RV begins to depreciate in value the moment it rolls off of the lot. This depreciation has nothing to do with the quality of the vehicle, it is just the nature of the industry. Many RV owners will purchase new motor-homes, then trade them in several years later to get the latest, greatest model. This does not mean that there is something wrong with their used RV, it just means that they wanted an upgrade. With that being said, it is quite possible to pick up a used trailer that is in very good condition and not pay a great deal for it. So, how will you use your RV? If you only plan to use your RV for occasional jaunts or the annual family vacation, then putting down a large chunk of change on something you will only use a few times a year is not really practical. In such cases, a used RV is definitely the way to go. Even the more extensive traveler can find a good used RV that is appropriate for their travel plans. A used RV may not have all of the latest, greatest features and newest technological innovations, but it could give you a nice vehicle for taking that family vacation. It is well worth checking out when deciding new versus used, even if just for the economical reasons. It could make owning an RV more than just a dream, you could have one in your driveway soon. If you are planning to live full-time in your RV the new vs used question is still the same, you can take an used RV and customize it to fit your specific needs. Whereas a new one you might not want to tear into it just after driving it off the lot. Ultimately the decision of new vs used is a personal one. We hope these tips were helpful for you in selecting your RV.